Diese Datei wurde durch File:President Obama Meets with Crew of Apollo 11 (200907200016HQ) (explored) DVIDS723610.jpg ersetzt. Es wird empfohlen, die andere Datei zu verwenden. Bitte beachte, dass das Löschen ersetzter Bilder einer Löschdiskussion bedarf. 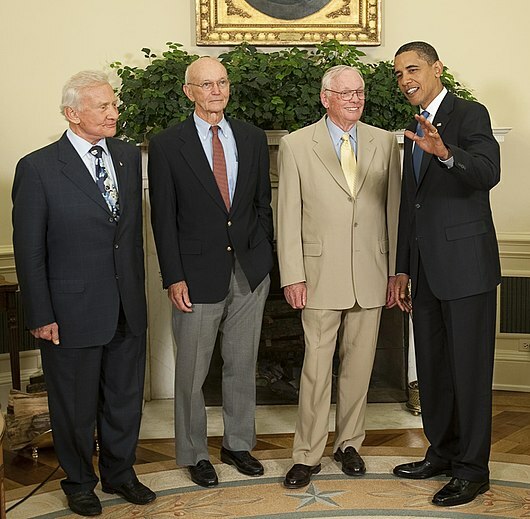 English: President Barack Obama chats with Apollo 11 astronauts, from left, Buzz Aldrin, Michael Collins and Neil Armstrong, Monday, July 20, 2009, in the Oval Office of the White House in Washington, on the 40th anniversary of the Apollo 11 lunar landing. Français : Le président Barack Obama discute avec les astronautes d'Apollo 11, de gauche à droite, Buzz Aldrin, Michael Collins et Neil Armstrong, lundi 20 juillet 2009, dans le bureau ovale de la Maison Blanche à Washington, pour le 40e anniversaire de leur alunissage.